Cormonachan Woodlands Atlantic Oak Woods, Loch Goil, Argyll. 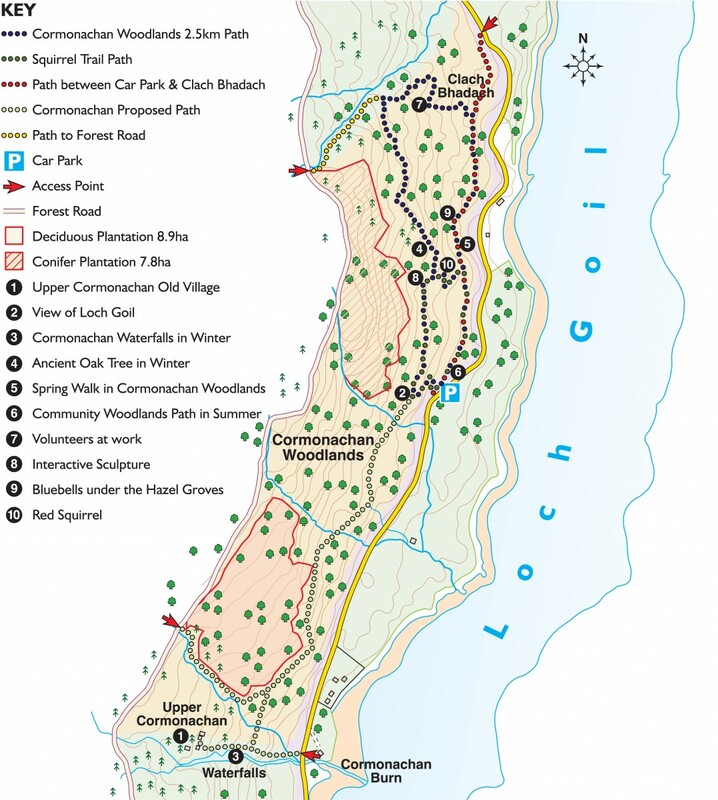 Cormonachan Woodlands are on the west side of Loch Goil, about 4 miles from Lochgoilhead and 2 miles from Carrick Castle, Argyll, PA24 8AF on a single-track road. Look out for the television aerial compound on the west side of the road where there is a new large car park or if walking you can access another entrance just after Lochwood House sign at Clach Bhadach. 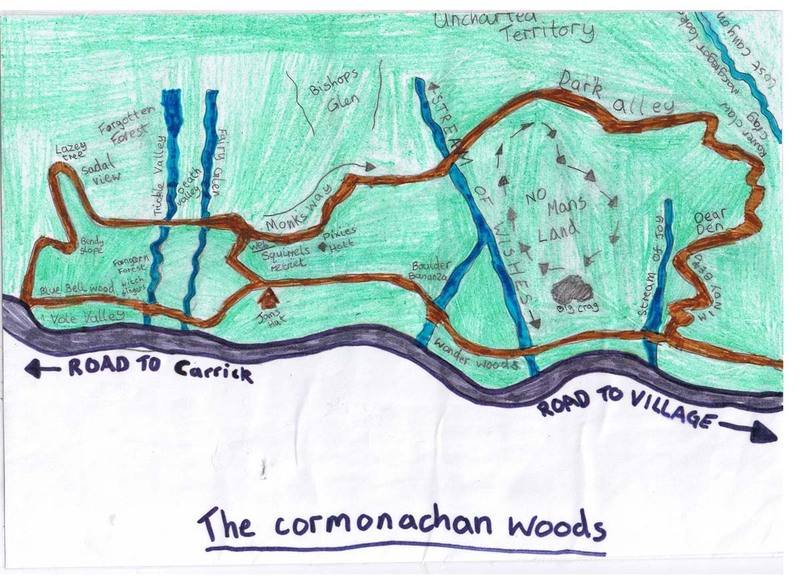 The Cormonachan Woodlands Association are currently trying to raise money for a new project for a path to connect the existing paths to the old village at Upper Cormonachan and the waterfalls and are looking for funding and donations. The woodlands car park is accessed from G.R. NS 196 975. 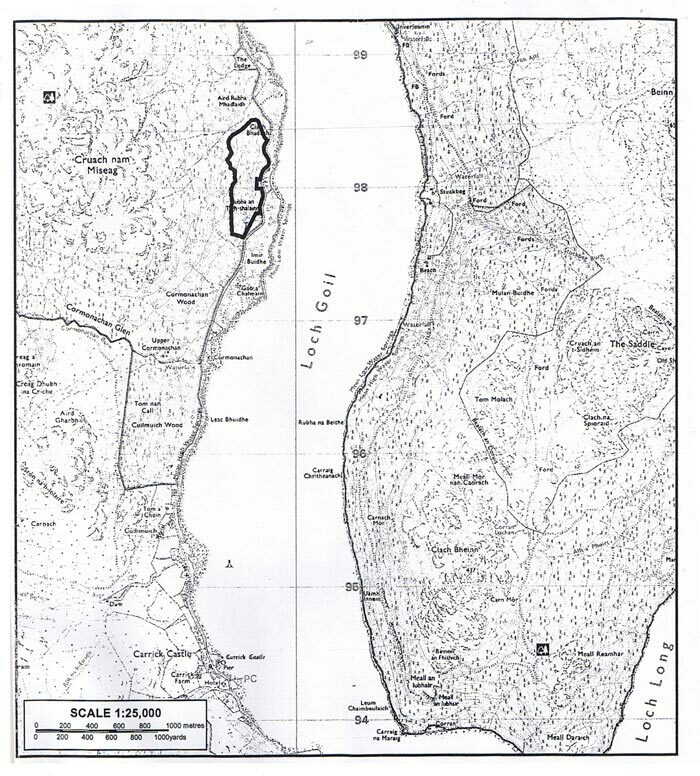 The short walk of 1 km is the green Squirrel Trail to the south of the area and the long blue circular walk around the whole area is approximately 2 ½ km. Please note these two paths have several steep inclines on them but benches and some picnic tables have been positioned in various places around the walks for you to rest and admire the views. These walks are described as easy to moderate. The red walk is an alternative route off the road between Lochgoilhead and Carrick Castle and vice versa through Cormonachan Woodlands. The yellow route is another alternative if walking to or from Lochgoilhead. Fires are NOT permitted in Cormonachan Woodlands. Protect trees, plants and wildlife. Leave things as you find them, take nothing away. Avoid damaging buildings, fences, hedges, walls and signs.